Today’s vinyl flooring offers an elegant appearance and an enduring value. If you only remember yesterday’s vinyl flooring… you’re in for a pleasant surprise. Nothing brings style, durability and comfort together quite like today’s vinyl flooring. And talk about affordability. That flooring in your office space may look like expensive hardwood. But it’s vinyl. Yes, vinyl flooring allows you to incorporate the look and feel of tile, hardwood or stone into your commercial space without the cost. Since vinyl flooring replicates hardwood or tile, you can use it in so many ways throughout your office or store. From high-moisture spaces like bathrooms, to high traffic areas where you want the look of hardwood. Today’s vinyl flooring is available in sheets or as luxury vinyl tile. And whichever application works in your space, you’ll love the comfort it provides. Step across a vinyl floor, and you’ll notice a more pliable feel to this surface that is relaxed and foot-friendly. For general vinyl floor care and cleaning, sweep your floor regularly (at least once a day) and be sure to wipe up spills promptly. Occasional mopping with the manufacturer’s recommended cleaning solution may be needed when dirt builds up and sweeping alone is not sufficient. Please note that soap or detergent products are not recommended for resilient floors as they will leave a dulling film on the surface. The Flex Floor products, however, can be cleaned with a damp mop and mild detergent or soap. Caution: Vinyl floors can be slippery when they become wet. Use extreme caution when walking on a wet floor and make sure your cleaning crew leave the appropriate caution signage if cleaning during business hours. 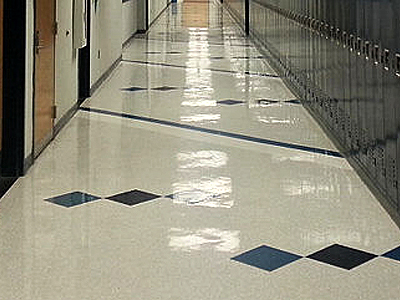 A good vinyl floor maintenance program will help keep your floors in top condition. Use doormats outside each entrance to your home to prevent dirt, sand, grit, and other substances such as oil, asphalt, and driveway sealer from being tracked onto your floor. Use non-staining mats on your floor. Do not put rubber-backed or latex-backed mats on your floor because they may stain or damage the surface. Close curtains or blinds where extreme sunlight hits the floor. A combination of heat and sunlight causes most vinyl floors, to fade or discolor. Protection is an important part of vinyl floor maintenance. The overall stain resistance of vinyl is excellent and most spills will wipe off quickly and easily with a clean cloth. Removing certain substances may take a little extra effort. Always use a clean, white cloth for wiping up stains and turn it frequently to avoid spreading the stain. Rinse with clean water and allow area to dry. Repeat if necessary.